Rarely is there a full week without sunshine in San Diego. The balmy, year round weather makes “America’s Finest City” ideal to visit. Hand in hand with the warm climate, the main attraction is of course the beaches. With so many gorgeous seashores to choose from, my picks are particular when it comes to choosing a family friendly place to lay your towels. 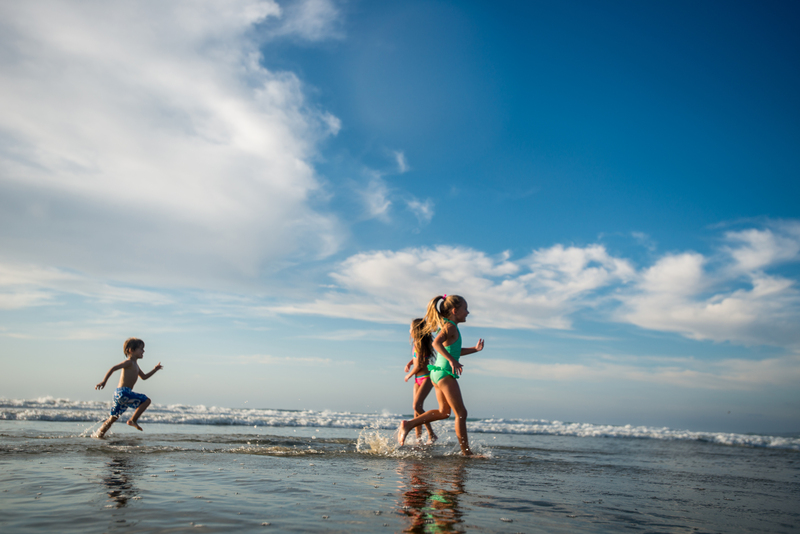 Here are my top 5 picks for taking the kids to the beach in San Diego. Located in Encinitas, hands down this locals’ spot is my absolute favorite for families. With recently updated bathrooms and a snack shack, Moonlight lets you spend a whole day in the sand with everything you need to keep kids happy. To top it off, there’s a play structure and park for those that want a little extra entertainment. Though it tends to get very crowded in the on-season, try venturing over to the far north as there tends to be a little more space. Though this destination charges a daily parking fee, it’s a favorite because you can park the car right next to the sand, making carrying all your snacks, buckets and shovels a little more convenient. It’s a great place to swim and complete with bathrooms in the lot just in case. During summer months, food trucks have been known to sell food for a convenient lunch. My favorite way to make an entire day of the beach is to start with an ocean view breakfast at the delicious Naked Café across from Fletcher Cover. After filling up on coffee and pancakes, make your way down the ramp to the water, noting the convenient bathroom locations along with a park for a few rides on the swing. Once you’ve had your fill of sun and swimming in the white water waves, finish off the day at family friendly Pizza Port, a short walk up the street. Undoubtedly one of the most break taking spots in all of San Diego is La Jolla, known as “The Crown Jewel.” Though many of the beaches have a dangerous “shore break”, the Shores is a gentle, bay like destination that is ideal for smaller children. Also equipped with bathrooms and a play structure, sandwich and ice cream shops are a short block or two away. With gorgeous white sands to choose from, my top pick for fewer crowds during peak season is to head to the stretch of the Silver Strand just before the Coronado Cays. Gorgeous beaches await as does a “tunnel” that will lead you to the Loews Coronado Bay Resort to pick up a picnic lunch from their Market to Go cafe. This entry was posted in Family Vacations, Outdoor Adventures and tagged family/attractions, outdoor recreation by Chelsea. Bookmark the permalink. My kiddos can’t get enough of Cardiff–they love it when we camp at the state park. It’s an annual trip we look forward to time and time again. LOVE LOVE LOVE Moonlight Beach! And Fletcher’s Cove gets major brownie points in my book because of Naked Cafe and Pizza Port!